“What should I buy as gifts for my friends and family?” is the same and popular question that many tourists traveling to Halong Bay or even planning a trip to explore Halong Bay, all come up with. It is not easy to buy souvenirs. As well, so much of the stuff that catches their eyes is too big, too heavy and oversized for transport.Halong Bay has to offer souvenirs of a diverse variety: local arts and crafts from wood, coal, horn items, embroidered and brocade items, porcelain, glassware and sea products (sea shells, pearls, etc.). Of course, you can find the classic Halong Bay junk postcards, photographic accessories and pictures. Nevertheless, everyone loves something extraordinary and unique. 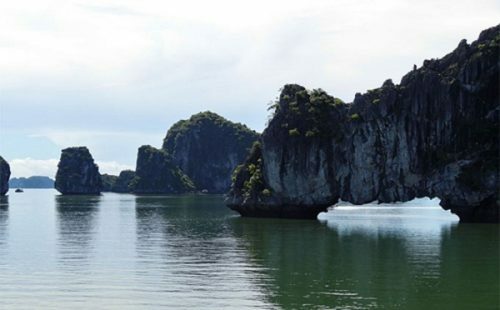 Therefore, let’s check out the list of the most amazing Halong Bay souvenirs you might have never seen before. Embroidery, ceramics, porcelain, crafts and arts made from coal are traditional souvenirs of Quang Ninh. Made of Anthracite coal, these products are extremely tough and hard in formation. 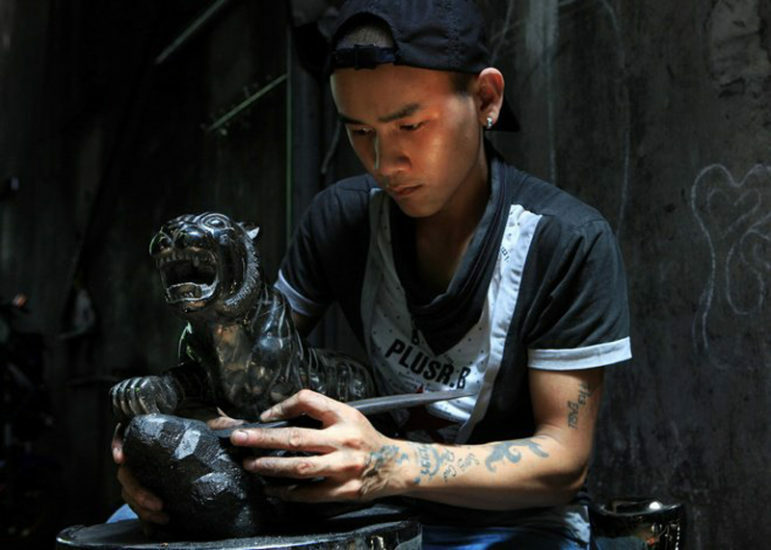 However, they are gently turned into valuable artworks by professional Quang Ninh craftsmen. It is a sophisticated process including many stages to create fine handcrafted coal products. Craftsmen have to firstly find high-quality Anthracite coal then see into various forms depending on the outputs’ size. Perforating and hewing coal is the next and also the most intense step. It is rather similar to what you can see in wood design process but coal is harder and crunchier to adjust. Therefore, only a petit mistake can make the products break. Grinding the raw outputs to make it more gentle and dazzling is the final step. They might not be extraordinary and can be found at other sea tourism spots in Vietnam but they are still unique souvenirs. Usual things expressed in a gorgeous way will work just fine. When cruising in Lan Ha Bay, Bai Tu Long Bay and Halong Bay or even paying a visit to the floating villages among the three bays, travelers can end up at this kind of stunning souvenir shop. Keychains, amazing conch shapes and big pearl shells are great presents for your family, relatives and friends. 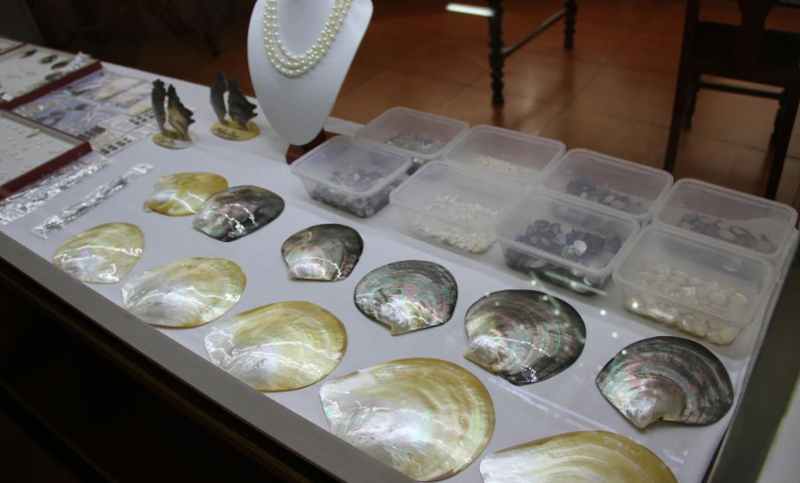 Pearl Farm in Halong Bay is the destination of these exclusive stuffs. 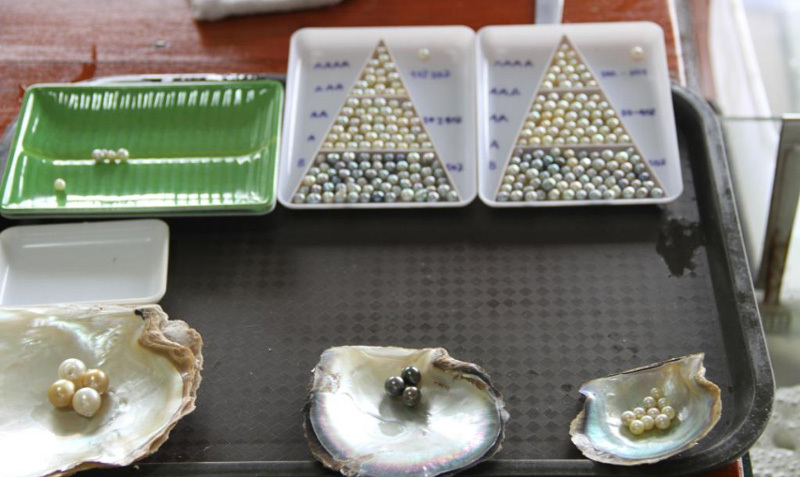 This is such a good place for those who would like to know how a cultured pearl is created to visit since it clearly demonstrates how they do this process from the beginning to the very end. It also shows how to use the pearls to create jewellery. A shop with a wide range of products is where you can get these beautiful souvenirs. The high price is the only thing you do not like. Therefore, if you want to get them, don’t forget to bring your wallet! Being an important part of Asian culture and one of the most important food crops in the world, rice is an indispensable part of every Vietnamese. 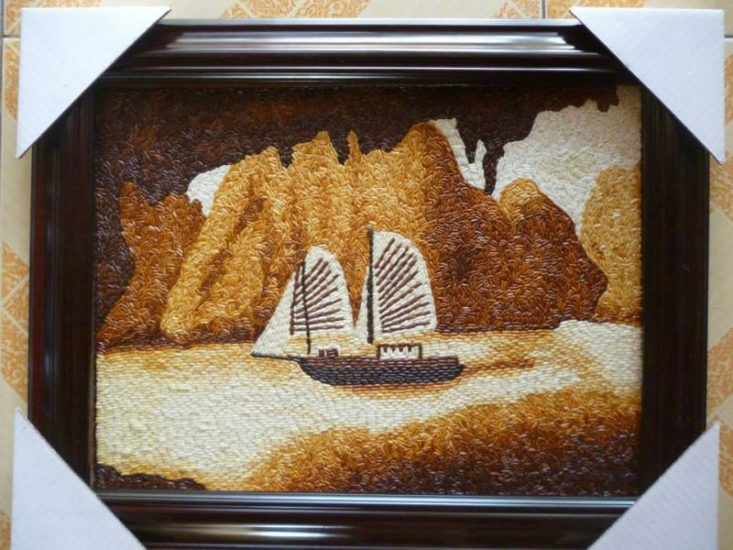 With their creative and intelligent mindset, Vietnamese artists have created a one of a kind rice masterpiece. According to sizes and colors, rice grains are carefully selected. By frying rice grains under the proper heat, masters can achieve subtle transition from one color to another. It requires a lot of patience and devotion to create such a beautiful rice painting. To create a rice grain painting of 80cm x120cm, artists have to work for from six to twelve days. Of course, the larger the picture is, the more time the artists have to spend. Otherwise, at souvenir shops, kiosks in any tourism spots such as Bai Chay Port and Thien Cung Grotto, Halong Market, or the night market, you can buy many beautiful items as usual. You can easily find perfect and meaningful presents from our country, Vietnam.